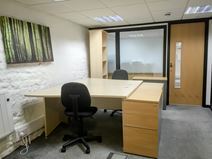 Office Space - Olney, Buckinghamshire. With a choice of furnished or unfurnished offices that are suitable for up to eight people, this beautiful period building is just a one-minute walk from the Market Square of Olney. The picturesque market town provides tenants with a great location equidistant from Northampton, Bedford & Milton Keynes.